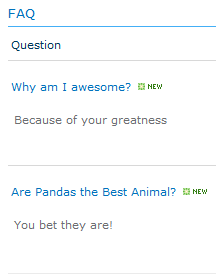 I have created a few of these FAQs (SP 2010) and added now, as tests. (don’t have a ‘newsletter’ style setting) It all works however, – under the top title bar there is another bar where the column titles appear, or in our preferred view, where the answers need to be expanded, just the title ‘answer’ appears. Plus a tick box. If answers are expanded the box can be ticked and the expanded answers are highlighted. Are you able to tell me the function this tick box might be meant to provide. Is it a filter ? It will be confusing for users as it is so noone has used this tool yet. I can change the title Answers to anything as it is meaningless to have it appear in concertina’d view. Not finding any other options. Jeanette, thanks for your comments! I believe you are referring to the item select box that comes standard when using the listviewwebpart. This is provided to allow people to select item(s) and then use the ribbon up top to perform actions (such as delete). You can remove this by going to View Settings, Tabular View and unchecking the box next to Allow individual item checkboxes. if i have new problem, could you help me ? peter, glad you found it useful! If you are having any trouble with something I’ve written about feel free to comment and I’ll see what I can do. If you have some other questions, a great site is http://Sharepoint.stackexchange.com I’ve been known to offer help there but you’ll also get help from a lot of other people. Thank you!! I am a novice with SharePoint, and have been teaching myself as I go revamping my organization’s site! I’d be lost without your information. Really Helpful info, I think I will be using your site more often as my SharePoint knowledge is Pants! Hi and thank you !! 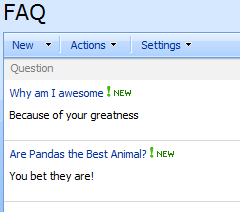 I would like to create a FAQ with screen dump in the answer. Is it possible to insert pictures in my answers ? the doctor cue to illnesses are reduced significantly. Thanks Chris! I did try it in the SP 2013. It worked very well. I need to include the search box on the top. Like it appears on the standard view page. Any advise? I looked into this and couldn’t get it to work either. It looks like anything other than the default style doesn’t seem to have the InPlaceSearch. This is regardless of the InplaceSearchEnabled attribute being set to True or False. I imagine this could be solved with some clever JSLink or XSL, but that would definitely go beyond the basic OOTB approach I was going for here. I’ll let you know should I come across any way of getting this to work. Thanks for the feedback! Thanks! Good idea, quick and easy. I’ve setup the FAQ page as described, but it seems it does not like to “keep” the Newsletter format. We’re running SharePoint via Office365 so not sure if that is impacting it or not. I can click on “Return to classic SharePoint” and the view will switch to the Newsletter view, but it does not keep that view when I exit SharePoint. Any suggestions?